Welcome to Day #1 of A Series of Sesame Chocolates. Another great blend of flavors and textures from Neo Cocoa. One of the joys of the modern world is the melding of food items from different continents over time by creative chefs of every kind: cacao from Central and South America, made into chocolate in North America; and flavor inclusions from around the world. 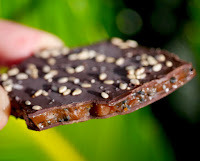 Today's chocolate contained sesame seeds (originally from Asia and East Africa). Rich in flavor and crunchy texture, sesame can go sweet or savory, and can pair nicely with chocolate. Beware. Today's Black Sesame Toffee Brittle from Neo Cocoa (Belmont, CA) would be a spookily addictive Halloween treat. It will disappear before your very eyes. Upon opening the sealed pouch of brittle, I detected a promising light sesame and chocolate aroma. At the heart of this carefully crafted brittle was a thin* layer of light, crunchy sweet toffee brittle riddled with toasted black sesame seeds. 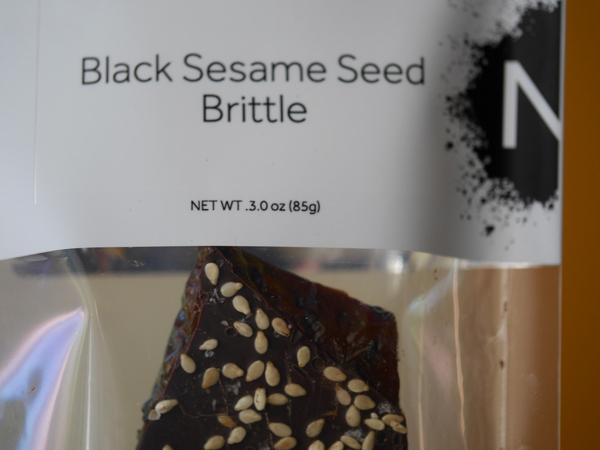 The brittle was covered (on both sides) with a thin* coating of 72 percent dark chocolate and then sprinkled with white sesame seeds. The results: an intoxicating, crunchy sweet and slightly salty treat. *I'm not sure how they managed such delicately thin layers, but I'm glad I didn't have to attempt making this at home.